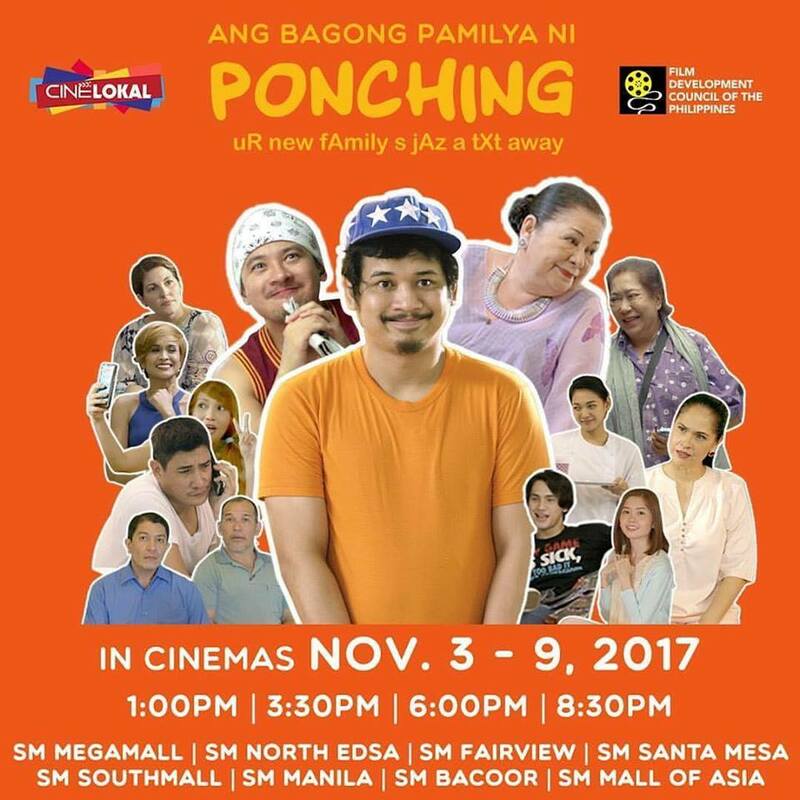 CineLokal features Ang Bagong Pamilya ni Ponching at eight (8) SM Cinemas on November 3-9, 2017. Written by Inna Salazar Acuña & directed by Inna Salazar Acuña & Dos Ocampo, the film was an official entry to Cinemalaya Film Festival 2016. 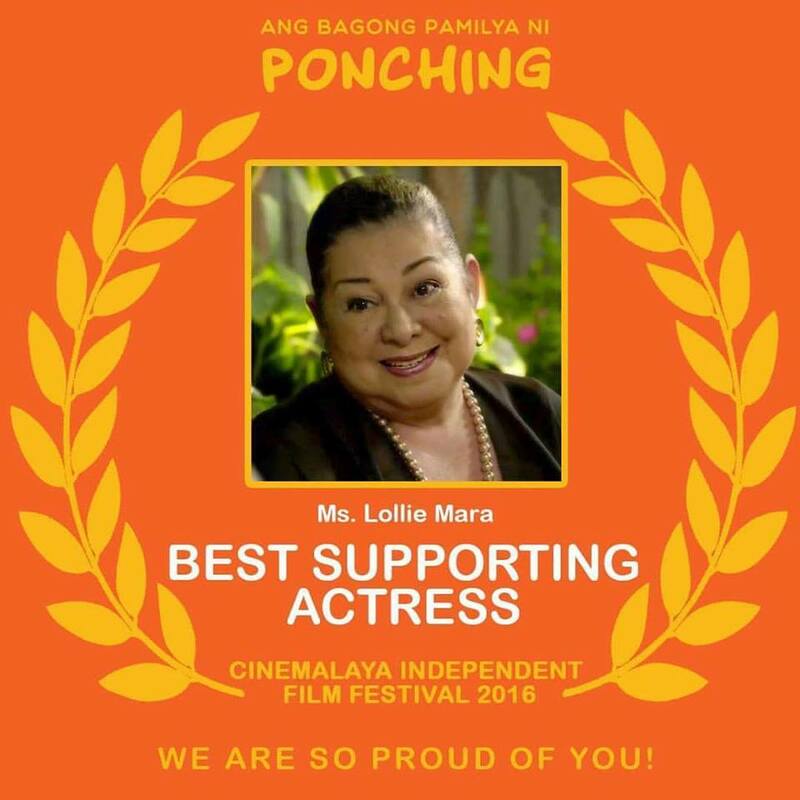 Produced by Sinematika, it stars Janus del Prado as Ponching, Ketchup Eusebio, Lollie Mara, Joyce Burton Titular, Odette Khan, Jackilou Blanco, Lui Manansala, Ricardo Cepeda, Mimi Juareza, Phynne Barnett, Alireza Libre, Richard Manabat, Sam Thurman, Ria Garcia & Manuel Velasco. What happens when an unassuming, religious young man sends out a text scam and accidentally cons a wealthy family? 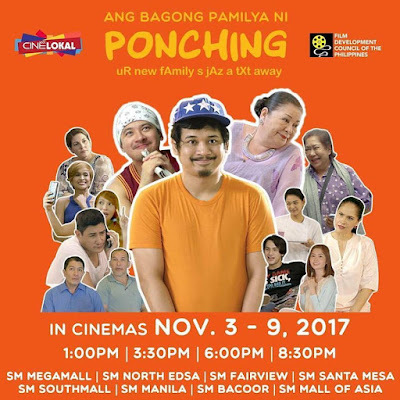 Ang Bagong Pamilya ni Ponching is a tale of a naïve and religious text scammer who accidentally cons a rich family into thinking he is their late relative’s estranged son. Ponching’s best friend Elmerson is an influential character to him, and he is responsible for getting Ponching involved in various scams for easy money -- peddling fake designer items, selling pirates dvds, and the like. Because business is slow, Elmerson resorts to text scamming people for load and money, and gets Ponching to do the same. By a twist of fate, Ponching accidentally scams a rich family into thinking he is the estranged son of their late relative, one who has left his long lost son, (whom they believe to be Ponching) a large inheritance. While Ponching is unsure of pushing through with the scam, Elmerson convinces him with the belief that “God would not have blessed them with this if He did not want Ponching to have this”. Ponching finally meets with the dela Veras, his “new family,” and they explain the inheritance will be given in tranches. Ponching is forced to keep returning to the house and bonds with the family until the completion of the tranches. At one point, a feeling he did not anticipate surfaces -- GUILT. Will he go back and come clean, or will he continue living a lie to keep everyone happy? 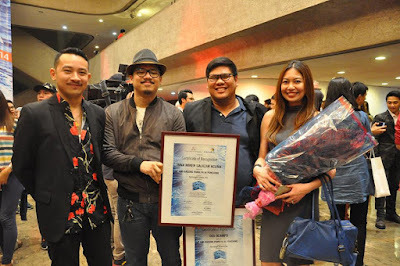 Ang Bagong Pamilya ni Ponching is not merely a comedic tale of an annoying text scam gone wrong – it is a peek into everyday Filipino society’s definitions of what is truly GOOD or BAD, the moral gray areas in between, the binary opposites of traditional values and contemporary taboos, the strangeness of family, and the familiarity of strangers. It is about how everybody is a “scammer” in the sense that we all tell lies – to our families, to our friends, and to our selves, but at the end of the day, we are all human, and the most divine thing we can do is show forgiveness.